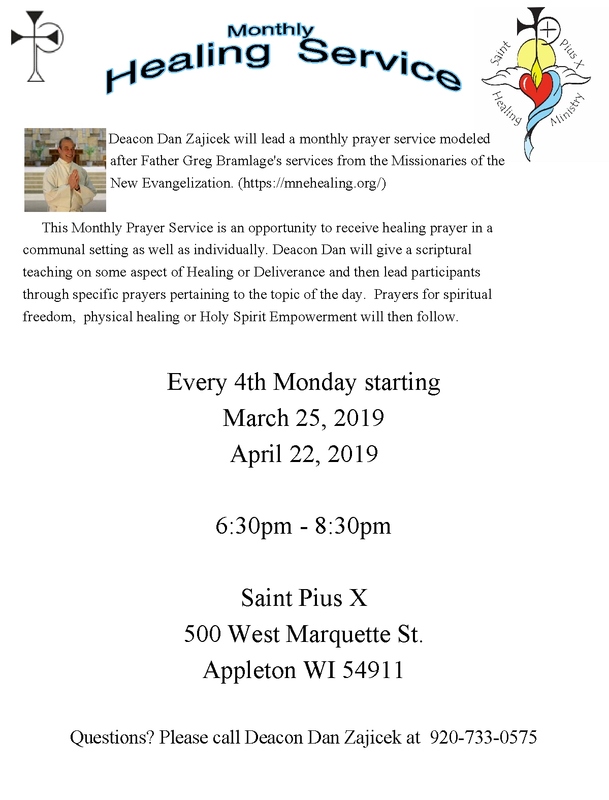 Weekend Mass Times: Saturdays, 4 p.m., Sundays, 8:30 a.m., 10:30 a.m., 6 p.m.
Saturdays: 8 a.m. and 4 p.m.
Sundays: 8:30 a.m., 10:30 a.m., 6 p.m.
Mondays, Wednesdays, Fridays: 8 a.m.
Wednesdays (school year): 8:40 a.m.
Thursdays: 8 a.m. and 5:30 p.m.
Thursdays: 8:45 a.m. in Mary Chapel and 5:10 p.m.
thanks to one of our very generous parishioners. Click the link to register for FORMED!  Use Code 6ZTRGN to gain free access and then set up your personal profile. Divine Mercy Sunday Celebration with Bishop David L. Ricken, Celebrant. Blessing of Religious Articles after Mass. 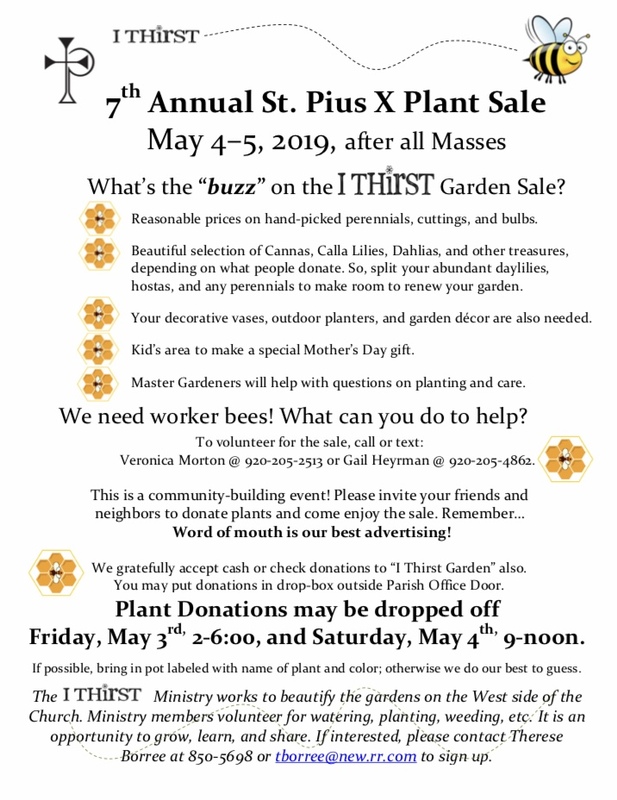 The Annual I Thirst Garden Plant Sale is Coming! 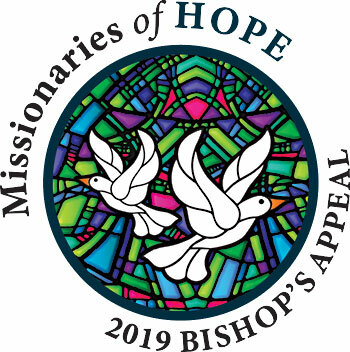 at (920) 272-8123, email bishopsappeal@gbdioc.org or click here to donate online. June 24, 6:30 p.m.-8:30 p.m.
from the Missionaries of the New Evangelization. 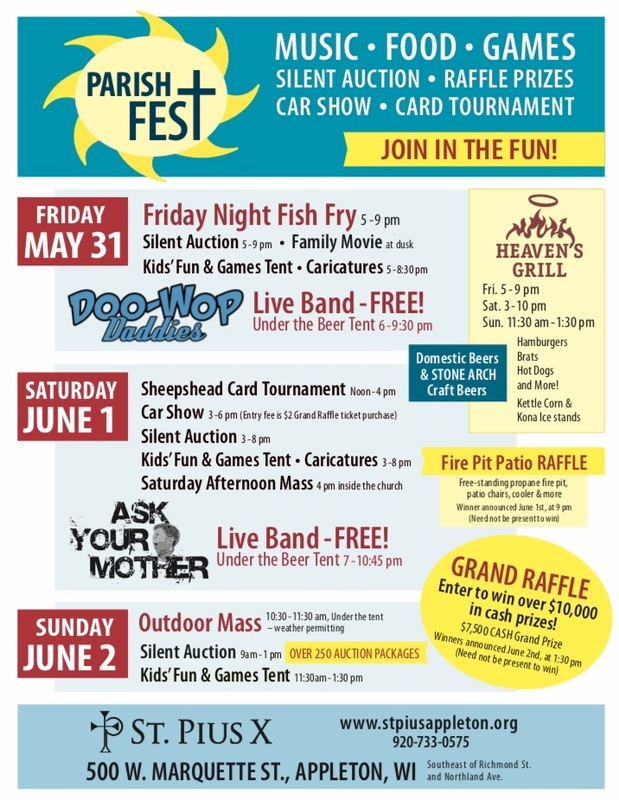 Parish Fest 2019 is coming soon to St. Pius X! Click here for full schedule and links to volunteer. Chapel of Divine Mercy Adorers and Adorer Partners Needed! Holy Hour for Children Tuesdays from 9 - 10 a.m. The special hour will NOT be a silent Holy Hour. songs, stories & prayer. Anyone with young children or babies is welcome! Fr. Jim Jugenheimer will facilitate! 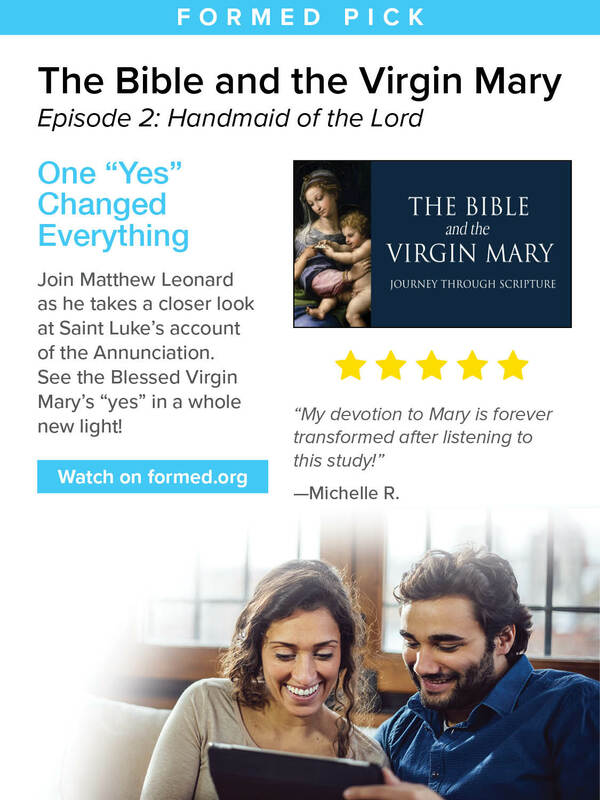 Have you ever wanted to learn about the bible, but didn’t know where to begin? Have you ever tried reading the bible, but gave up in frustration or confusion? whether you are a first time student or for the more experienced. Cost is $30 for the workbook. Pay with check in the Parish Office. Join us for Adult Pick-Up Basketball in the St. Pius X gym every Sunday night from 8-10 p.m.! With 10 to 15 players each week for full-court basketball with fouls and violations called by offense or defense. We play by 2’s and 3’s to 15, with the winner staying on the court for the next game. After 2 consecutive games, the winners watch. Bring two shirts or a reversible basketball shirt. We ask for a $2 donation each time we play. Whether you play all the time, haven’t played in a while, or not at all, you are welcome to join the fun! If you have any questions, please contact Brian Schwartz at 954-9081, or email: brianandpeggys@att.net. Caring Cards is looking for volunteers to make greeting cards for nursing home residences. We will be recycling old cards to make new cards for birthdays, Easter and Christmas. We meet on the 2nd Friday of the month at 2:00 p.m. and the 3rd Monday of the month at 6:30 p.m.
Greeting Card and Card making Supply donations for birthday, Easter, and Christmas cards (new and used), cardstock (not construction paper), adhesive or glue sticks and card making supplies, such as stamps, stamp pads, and paper trimmers are needed. Donations can be made in the cabinet under the church bulletin near the church office labeled "Caring Cards." Thank you for all the donations we have received! Mark Your Calendars for the St. Pius X 2019 Summer Vacation Bible School! June 10-14, from 9 a.m.- noon, for children 4 years old to ENTERING 4th grade. Registration is now open! Follow the link below to register. Space is limited so reserve your child's spot TODAY! If you or your Middle/High School child are interested in volunteering e-mail Debbie at ffchildren@stpiusxappleton.com. Faith Formation Classes resume Wednesday, April 24. The Faith Formation Closing Mass is May 1, at 6:30 p.m. The Celebration of First Eucharist will be held during the 8:30 a.m. and 10:30 a.m. Masses May 5th. The remaining Confirmation Session is Sunday, April 28 from 7-8:30 p.m. in the North Narthex. The Sacrament of Confirmation will be celebrated Friday, May 3, at 6:30 p.m.
Louisville, Kentucky, June 15-22 with Holy Spirit Parish in Darboy. Catholic Heart Workcamp Fundraiser Envelope Boards are in both Narthexes. Please contribute what you can! All donations are appreciated. Thank you! 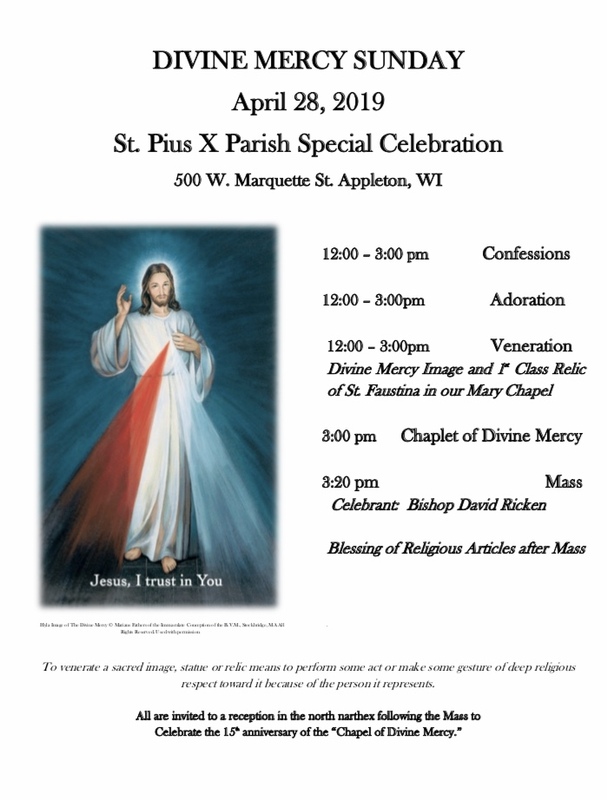 Contact Jennifer Buelow at: ffyouth@stpiusxappleton.com for more information and to get on the email list. The St. Pius X Parish Office Team would like your feedback! Click here to complete a quick survey regarding our annual Parish Guide Book & Directory (not the photo directory). The link is also available on our Facebook page, or paper copies are available in the Parish Office. One survey per household, please. Thank you!